Taipei, Sept. 28 (CNA) Taiwan's bubble tea industry has been seriously battered by a reckless German newspaper report published last month, the chairman of Possmei Corp., a New Taipei-headquartered manufacturer of bubble tea drink ingredients, complained Friday. 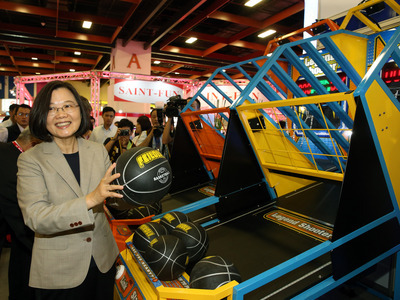 The blunder has even led to disputes between Taiwanese businesses and their customers, Possmei Chairman Wang Chun-feng told CNA. He harshly criticized a German newspaper, Rheinischen Post, and scholars at a technical university in western Germany, for reporting that the tapioca balls in bubble tea drinks allegedly contain carcinogens without giving the sources of the samples tested. They could not even explain in detail how the test was conducted. "It was very irresponsible," Wang said. Taiwan's Food and Drug Administration confirmed Friday that in a second round of tests conducted by German authorities, Taiwanese bubble tea was found to be free of cancer-causing chemicals such as styrene, acetophenone and brominated biphenyls or biphenyl carbonates, as the German media reports alleged. A total of 84 Taiwanese beverage products were tested -- six samples of bubble tea, 34 samples of concentrated juice and 44 samples of "popping boba," a colorful gummy ball containing flavored juices that can be added to drinks, agency officials said. The products were also found to contain no excessive levels of heavy-metal contaminants or other health-threatening agents, the officials added. Wang said German imports of bubble tea drink ingredients slumped to zero in September from an average of 200 containers of ingredient products per month before the Rheinischen Post reported on Aug. 22 that a test conducted by RWTH Aachen University found that bubble tea contains carcinogens. The report, which then led other German media outlets to run similar reports, also said the samples were collected from an unnamed franchise chain in another city in the state of Nordrhein-Westfalen, and that the ingredients in the drink were imported from Taiwan. "The inaccurate report has led to the collapse of the local bubble tea drink industry. At least half of the businesses in the sector were closed down," Wang said. Although Taiwanese products have been found to carcinogen-free, Wang was not sure what could be done to restore consumer confidence in Taiwanese products in the German market, he added. Nearly 1,000 individual and franchise bubble tea shops have sprouted up in Germany since the beverage gained popularity in Germany a few years ago, turning bubble tea drinks into the fourth most popular beverage there, behind mineral water, coffee and cola, Wang said.